Latest public record from the Canby Police Department and the Aurora Fire Department. Police reports are for incidents and crimes reported or that occurred August 8 to Aug. 14, 2017. There were hundreds dispatched calls during this period, but not all calls for service result in a written police report. 1:04 p.m., women's wedding ring band found in the police department parking lot. Owner unknown and item lodged in property/evidence for safekeeping. 1:23 p.m., citizen came to the department to report identity theft. Unknown suspect opened accounts using her name to make fraudulent purchases totaling $1,670. 2 p.m., man reports a stolen knife by a friend's girlfriend who when contacted by police said she never intended to sell it and turned it over to police. The man was reunited with his property, S. Locust Street. 8:20 a.m., police observed a man walking down the block and in moments returning in the opposite direction with a bicycle. The man explained that the bike had been stolen from a friend and he told the owner he would look for and return it. He was joined by the friend -- who didn't own the bike -- and upon further discussion officers arrested Justin D. Houghton, address unknown, for violating conditions of his parole by being in the company of known drug users. 10:17 a.m., after responding to a neighborhood disturbance involving a dog off a leash, Shane C. Dye, age 38, of Canby, was arrested for assault, SW Third Avenue. 10:24 a.m., officers received a report of an unknown person making fraudulent purchases at retail stores the prior evening. The amount totals $300 and the victim suspected someone cloned the card for the identity theft. 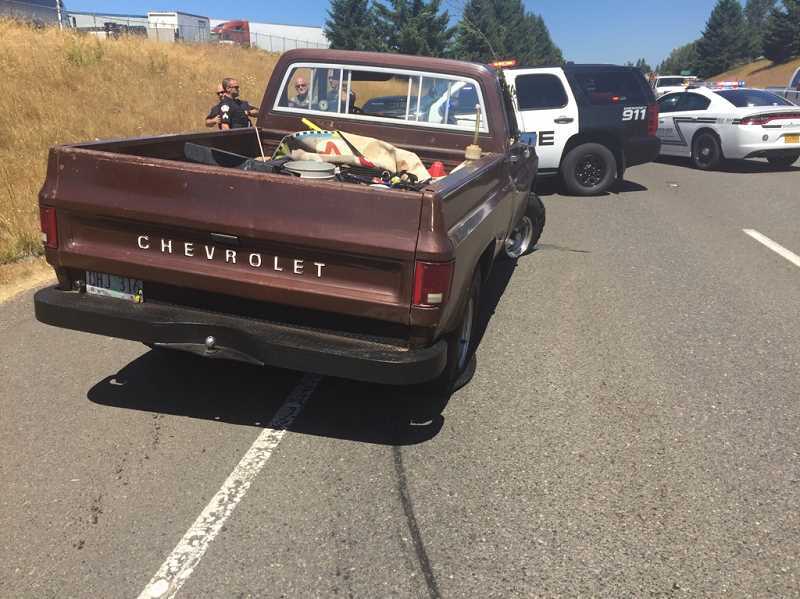 10:48 a.m., officers stopped to talk with a man riding a bicycle along Highway 99E and discovered he had an outstanding felony warrant from Yamhill County Circuit Court for failure to appear on felony possession of methamphetamine charges. Christopher Matthew Levi Benzel, age 22, of Woodburn, was arrested on the warrant. 2:05 p.m., Unknown suspect took a red Radio Flyer wagon with wood sides while owners were playing in Maple Street Park. 11:45 p.m., Officers observed a long vehicle parked in the corner of a public parking lot well after businesses closed. Upon checking, one of the two occupants appeared to be having difficulty breathing so medical personnel were called to the scene. The vehicle's owner was contacted later and asked that the car be towed from the scene. 10:22 p.m., following a traffic stop, officers issued an MIP (minor in possession) citation to a juvenile, SW First Avenue/N. Ivy Street. 12:35 p.m., Roger D Folsom, of Portland, was arrested for misdemeanor driving while suspended, S. Highway 99E near S. Barlow Road. 2:54 a.m., two juveniles walking home from a friend's house were taken into custody in the area of NE 10th and Ivy for violation of curfew. 8:53 a.m., reported theft of two bikes the day before at Canby Community Park. Both bikes described as Specialized 21-speed brand bikes, one blue and the other a shade of red with a value of $400 each. 8:57 a.m., a man came into the department to report he was contacted and told his fiance had been kidnapped in Mexico the prior day and he must pay a ransom. Officers assisted him with contacting the appropriate officials. 10:57 a.m., a man reported the caregiver for his neighbor had walked into his home while he was in the backyard and that this unwelcome intrusion had upset him. Officers contacted the neighbor and advised her she couldn't go into another person's residence without being invited, and relayed the man's message that she was trespassing on his property. 8 p.m., a man observed walking his bicycle down the middle of the railroad tracks was recognized by officers as a suspect wanted for charges by Hubbard police. Glen E. Stevens, age 65, of Hubbard, resisted arrest and was subdued and jailed on charges of criminal trespass and interfering with a police officer. 9:40 p.m., officers responded to a neighborhood disturbance call, N. Birch Street. 11:56 a.m., customer failed to pay the $37 for their family's meal at a local restaurant, 1300 block SE First Avenue. 4:12 p.m., officers responded to a domestic disturbance call, NW 14th Avenue. 11:09 p.m., man reported the he believes his bike tires were slashed in retaliation for accidentally hitting a girl in the head with a basketball while playing a game earlier in the day. 11:29 p.m., officer responded to a suspicious vehicle report investigated and arrested Sharon K. Darby, age 55, address unknown, on a felony Deschutes County Circuit Court warrant. Original charge was failure to appear for possession of methamphetamine. 6:48 p.m., while patrolling Canby Community Park, officers recognized and arrested Kelli N. Pearce, age 20, of Canby, on a felony Clackamas County Circuit Court warrant for failing to appear for unlawful possession of heroin. 9:47 a.m., two vehicles in violation of city ordinance tagged for towing, SE Third Avenue/SE Township Road. 9:20 a.m., a man alleged that last week someone entered his home during his absence and left sunglasses and a bottled beverage on his table, N. Douglas Street. 10:29 a.m., graphic graffiti language was discovered painted on a control box at Locust Street park. City personnel painted over the graffiti. 10:32 a.m., report of lost Oregon driver's license while out walking the dog, SE Territorial Road. 10:33 a.m., fresh graffiti on both sides under the overpass at S. Sequoia Parkway reported. 10:45 a.m., citizen turned in a cell phone found in the S. Redwood Street area. It was lodged in property/evidence and attempts will be made to find the owner. 4:09 p.m., non-injury hit and run reported in business parking lot, SE First Avenue. 6:48 p.m., report of attempt to use falsified prescription to obtain drugs, SW First Avenue. 9:50 p.m., driver cited for driving uninsured and suspended, vehicle towed, SE First Avenue/S. Pine Street. 11:50 p.m., driver stopped for rolling through a stop sign and cited for driving while suspended, vehicle towed, SW First Avenue/Berg Parkway. 9:19 a.m., first aid, 12000 block of Fargo Road. 10:10 a.m., Miscellaneous call, 12000 block of Ehlen Road. 1:06 p.m., first aid, 14000 block of Smith Rock Avenue. 1:06 p.m., first aid, 21000 block of Bents Road. 5:42 p.m., first aid, 22000 block of Bents Road. 10:29 a.m., vehicle fire, I-5 southbound a milepost 279. 1:21 p.m., motor vehicle accident, 19000 block of Boones Ferry Road. 1:52 p.m., motor vehicle accident, Boones Ferry Road and Feller Road. 2:02 p.m., first aid, Feller Road and Pirelli Lane. 2:24 p.m., first aid, 15000 block of Park Avenue. 3:51 p.m., air alert, 22000 block of Airport Road. 12:28 a.m., fire alarm, 13000 block of Wisteria Drive. 12:56 a.m., first aid, I-5 southbound at milepost 282. 9:34 a.m., motor vehicle accident, I-5 northbound at milepost 275. 4:23 p.m., miscellaneous call, 11000 block of Main Street. 5:32 a.m., motor vehicle accident, 26000 block of Meridian Road. 6:39 a.m., miscellaneous call, Highway 99E and Lone Elder Road. 9:39 a.m., first aid, 14000 block of Smith Rock Avenue. 1:16 p.m., first aid, 12000 block of Arndt Road. 1:34 p.m., motor vehicle accident, I-5 northbound at milepost 275. 6:02 p.m., motor vehicle accident, Highway 551 at Piper Street. 6:58 p.m., first aid, I-5 southbound at milepost 283. 11:39 a.m., first aid, 14000 block of Smith Rock Avenue. 1:09 p.m., first aid, 21000 block of Dolores Way. 1:39 p.m., first aid, 14000 block of Smith Rock Avenue. 1:41 p.m., first aid, 11000 block of Bunting Lane. 12:03 a.m., fire alarm, 20000 block of Ernst Road. 1:30 p.m., motor vehicle accident, I-5 northbound at milepost 282. 3:12 p.m., fire alarm, 21000 block of Main Street. 4:31 p.m., air alert, 21000 block of Airport Road. 2:26 p.m., first aid, 11000 block of Donald Road. 2:27 p.m., motor vehicle accident, Yergen Road and Donald Road. 10:48 a.m., fire alarm, 20000 block of Case road. 1:37 p.m., motor vehicle accident, I-5 northbound at milepost 278. 2:59 p.m., first aid, 19000 block of Fobert Road. 3:46 p.m., first aid, 25000 block of Class Road. 4:11 p.m., motor vehicle accident, I-5 northbound at milepost 278. 3:12 p.m., mutual aid, 17000 block of Whitney Lane. 9:30 p.m., first aid, 9000 block of Yergen Road. 9:51 p.m., fire alarm, 20000 block of Ernst Street. 10:20 p.m., first aid, 21000 block of Bents Road.